Huge property suitable for large diving groups. All beds have doonas and pillows, please bring your own sheets or sleeping bags. Electric wok, electric frypan, sandwich toaster, blender, etc. 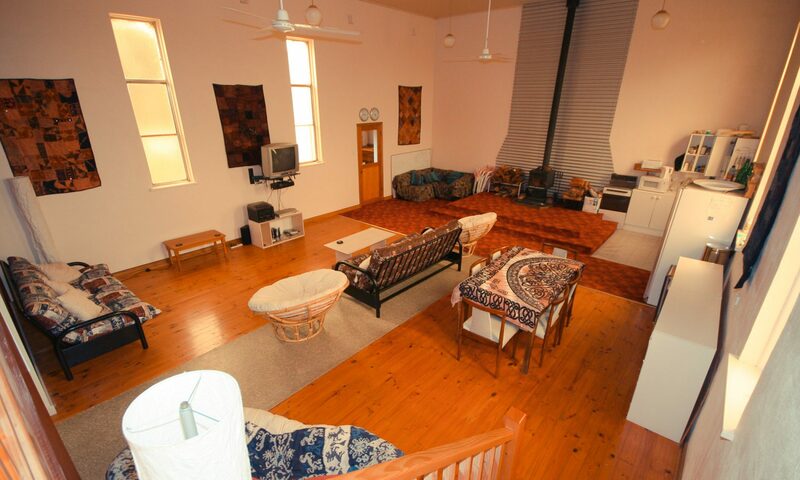 The church offers cosy accommodation for Cave Divers and groups wishing to stay somewhere a little different. St. Michaels Kongorong was the local Catholic church between 1963 and April 2002. Between Easter 2002 and 30 June 2002, A local builder & plumber did a fabulous job of installing a mezzanine floor that houses the bunk style accommodation, two bathrooms and a lovely staircase. The Huge open plan living room & kitchen is warmed by a wood burning stove and has all the modern cooking appliances you could ever need. There are several large sofas, large television, DVD, VCR, Stereo. Also trestle tables and whiteboard for use by instructors or for rebreather divers setting up their gear. You can email Deb using the form below or at deb@businessbookkeeping.com.au. Alternatively, you can call Deb on 0419 882 800.